Info Gov. 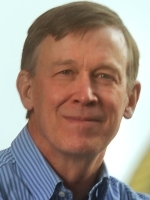 John Hickenlooper's ambition for Colorado is even bigger than his name. A geologist-turned brewpub pioneer who had never run for political office (not even student council) before running for Denver Mayor in 2003, John was elected Governor of Colorado on Nov. 2, 2010. His boundless energy, enthusiasm and creativity are generating tremendous optimism and confidence in Colorado's future. After being laid-off as a geologist in the 1980s, John struggled for a while until he came up with the crazy idea to open Colorado's first brewpub. As John likes to say, "I didn't know anything about starting a business. I didn't even know what a pro forma was." But John went to the library, got books on how to write a business plan and started the long process of making his vision a reality. Although he had to interview with more than 20 banks, he eventually opened The Wynkoop Brewing Co. in the dilapidated warehouse district of downtown Denver. His vision proved successful, and his brewpub and restaurant are now mainstays of Denver's community, and the beating heart of the lower downtown neighborhood. As the mayor of Denver, John's business abilities, partnered with the team he put together at the city, played important roles in the success he achieved after taking office. In 2005, after serving only two years as mayor, Time Magazine placed him among the top five "big-city" mayors in the country. In 2008, John brought a new level of attention to the Mile High City, successfully marketing Denver as an ideal place to host the 2008 Democratic National Convention. Born in Narberth, Pa., John lost his father at a young age and was raised by his notoriously frugal mother. Having lived through the Great Depression, John's mother never wore a dress she didn't sew herself, and she washed plastic wrap and aluminum foil for reuse. Before ever taking office, he tossed aside regional conflicts - announcing to suburban mayors that the days of "Denver first" were over. John pushed aside partisanship and reached out to Colorado's Republican Governor to bridge a new, city-state partnership. Just like he did in his early days in LoDo, John knew that as the state and region succeeded, so would Denver and vice-versa. In 2005, John introduced GreenPrint Denver, a plan to improve Denver's urban environment by increasing efficiency and decreasing greenhouse gas emissions, promoting "green" urban design, and implementing an aggressive waste reduction campaign. The effort has reduced energy use at Denver International Airport by 11 percent per passenger, increased recycling throughout the city by 69 percent, and reduced water use at City Hall by a million gallons per year. In 2008, John successfully marketed Denver's long-shot bid for the 2008 Democratic National Convention. As promised, John avoided using public funds for the campaign. Instead, he traveled the country to garner support from leaders in the Democratic community, procuring the necessary funding to host the convention. The event put Colorado on the international stage and brought more than $260 million into the local economy. Overall, his tireless efforts to improve the city of Denver paid-off. Despite shrinking budgets and managing the city through two national recessions, a recent citizen survey found that Denver's overall community quality rating improved to 86 percent in 2010 from 78 percent in 2002. And perhaps most importantly, John has a track record of bringing people together to solve problems instead of stoking the same old partisan squabbles. His ambition is for Colorado is a shared ambition - that we all join together as One Colorado to solve the challenges faces our state. Because this is Our Colorado.